Apple's release of the iPhone 4S was largely panned by bloggers and journalists, most of which were looking for a much more dramatic upgrade. The 4S seems to be more of an upgrade aimed at the millions whose iPhone 3GS have become long in the tooth, and for these consumers this phone is a marked improvement. Like Apple has said, iPhone 4S looks nearly identical on the outside to the iPhone 4, but is a new phone on the inside. From the dual-core processor to the better camera, and the innovative digital assistant in Siri, moving from the 3GS to the 4S is like night and day. Is That an iPhone 4, or a 4S? The design of the 4S has the same candybar as iPhone 4. For those coming from the 3GS this will take some getting used to: I found holding the phone less comfortable than the 3GS. Controls for the 4S are located in the same place as they were with every other iPhone. Sleep/power button on the top right of the phone, vibrate and volume controls on the upper left, and the home button on the front. That said, there is a minor difference in design and that's in the positioning of the vibrate switch. Due to the difference in the antennas between the 4 and 4S (mainly due to the CDMA and GSM phones being combined into a single device), Apple has moved the vibrate switch down a few millimeters. Why is this important? It will directly affect the purchasing of a case for your phone. Some cases will not fit because the hole cut for the switch is quite precise. There is a solution for this though: either use one of Apple's iPhone 4 bumpers -- they will fit -- or a Verizon iPhone case. Apple moved the switch in the CDMA iPhone as well. I recommend some caution when purchasing a case: make sure the holes line up. A bit of a pain, but it will save you a second trip to return the case you just bought. What you can't see is where this phone shines. The 4S is zippy, the display is beautiful, and iOS 5 finally brings the iPhone on par with competing Android devices. The biggest difference that 3GS users will notice right away is the clarity of the screen. Apple's Retina Display is just stunning: you really can't see the indidvidual pixels like Apple claims. Photos are vivid, text unpixelated, the tiniest details jump off the screen. Hands down, this is the best display I've seen on any phone. After that, you'll notice the speed. Apple claims a speed jump of two times over the iPhone 4, which I can't attest to since I own a 3GS. The 4S feels at least two to three times faster -- if not more -- than the 3GS though. Bootup times have been significantly reduced. I see about a 15-second faster bootup in the 4S, equaling a lot less waiting time to use the phone. Even webpages load a heck of a lot faster. Testing out my old 3GS side by side with the 4S over WiFi, I loaded the BetaNews front page. The 4S killed the 3GS, with the page completely loading a full 20 seconds faster. My, What Beautiful Pictures You Take! What good are those display and speed enhancements if you can't put them to good use? Apple has with its new eight megapixel camera included with the 4S. The extra processing power allows the phone to offer image stabilization and face detection capabilities, as well as offering significantly reduced wait times to take the picture you are looking for. iOS 5 also offers an important enhancement that makes iPhone 4S a worthy replacement for your point and shoot: hitting the home button twice will bring up a camera button on the lock screen: hit that and it will take you directly to the camera app. Even better? The up volume key is now your shutter button -- no more tapping the screen to take the picture (of course you still could, but why?). The 4S also takes 1080p HD video, and these videos are quite impressive for a cellular phone, although maybe not the best of the best. I'd equate it to the quality of Cisco's Flip cameras, which is pretty good but certainly not a replacement for the good old camcorder. Apple claims that the iPhone 4S competes with leading 4G devices through "dual antenna" technology. Whereas iPhone 4 had a theoretical maximum speed of 7.2Mbps, the 4S is said to max out at 14.4Mbps. I didn't see much difference in my own tests, though -- getting about the same data throughputs as I did on the 3GS. Perhaps I live too far from a major metropolitan area, but I doubt it. More tests are needed before I can make a true determination here. There has been quite a bit of talk out there that the claims of speedier data would be only available on AT&T, and even there due to network architecture may not be possible. If you're on Verizon or Sprint this won't even matter: 3G on the CDMA side will be limited to a maximum of 3.1Mbps, regardless of whether it's the 4 or 4S. 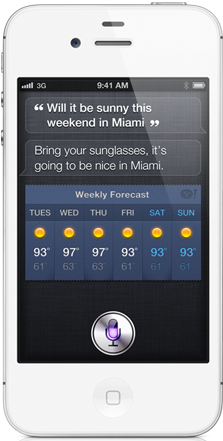 While a good portion of the enhancements to the 4S are to the hardware, voice technology Siri is the feature that got me to upgrade. Calling it voice recognition doesn't do it justice: this is essentially the first intelligent assistant integrated into a mobile device. Siri will perform your standard voice-activated commands just like any comparable system on the Android or Windows Phone platforms. But Apple goes a step further here -- you essentially talk to your phone (Think "Star Trek", where the computer takes commands and answers questions). Siri impresses. Tell it to "Call Dad". It may not know who Dad is, so it asks you who is your father. Give Siri the name of your dad in contacts, and it will remember. Ask it a question like "Will it rain Friday?" and it will check the forecast and let you know. Where Siri goes above and beyond is in the questions you can ask her. Ask "Who was the 20th president of the United States?" Siri pulls up information from Wolfram Alpha showing information on James Garfield. How about "How many feet in a meter?" Siri responds with 3.281 feet. The way this works feels like something right out of Star Trek. Is it perfect? No. The biggest downfall is the cloud-based method in which it operates. On launch day for hours at a time I was unable to use Siri as it could not reliably connect to Apple's servers. From time to time it also had issues in understanding my speech. Attempting to use the phrase "Call Nana" confused Siri, which attempted to call my friend Nora instead. But regardless, most of the time Siri operated surprisingly well. Android has long had some neat features that really attracted me, such as notifications. iOS 5 mimics this, introducing the Notification Center. Like Android, swiping down from the top of the screen brings up a list of your notifications. This was a major annoyance for me in previous iOS versions. Since I have a lot of apps that use push notifications, sometimes I'd cycle through a half-dozen or more of those blue notification popups before getting them all cleared. Not fun. Another neat feature is iMessage. Essentially BlackBerry Messenger for iOS, if you have a lot of iPhone-wielding friends you're about to use a whole lot less texts. The iPhone knows which of your contacts use iPhones, and will default to iMessage there (blue bubbles versus the traditional green). Should you buy iPhone 4S? The decision on whether or not to buy the 4S is largely going to depend on the individual. Coming from an iPhone 4, while there is a considerable performance bump, it just doesn't seem like enough to justify upgrading at this point. However, if you're like myself and are still stuck with the 3GS and are now out of contract, there's no real reason to wait. Improved performance and now capabilities demand upgrading. Will iPhone 5 be out within a year? Probably so. Still, I don't foresee it coming anytime soon. A significant change in design is expected and also the addition of LTE. Who knows? Carriers may offer early upgrades again. I've been using the 4S for about 72 hours now, and don't regret using my upgrade eligibility for this device despite my reservations about the iPhone 4 design itself. As I explained at the beginning of this review, 3GSes are getting long in the tooth. There's just no reason you should wait for iPhone 5 at this point. LTE is still a year away from being viable across Apple's partners, and to me that's the only excuse not to upgrade to the 4S at this point.